Notorious for their actions during the Temporal Cold War, the Sphere Builders are an extra-dimensional race best known for their creation of the Delphic Expanse. While the network of spheres which generated the Delphic Expanse was destroyed in the mid-22nd Century by Captain Jonathan Archer, the impact of the Sphere Builders can be seen in other eras, such as during the Battle of Procyon V.
Sphere Builder technology is highly unstable in our dimension, making it very difficult to recover and study. The temporal and dimensional anomalies present during the Battle of Procyon V gave the Federation of that era the perfect opportunity to preserve, stabilize, and repurpose their recovered devices. Some of these devices, including a handful of fully functional Sphere Builder ships, have made their way into the hands of the Lobi Crystal Consortium of the 25th Century. The Lobi Crystal Consortium is perfectly willing to sell this exotic technology to esteemed Captains within the Federation, Klingon Empire and Romulan Republic…for the right price. We’re very excited to announce the stats for the Tier 6 Sphere Builder Edoulg Science Vessel, Sphere Builder Denuos Dreadnought Carrier and the Tier 5 Sphere Builder Arehbes Destroyer! These new ships will be available immediately upon the release of Agents of Yesterday: Artifacts on PC through the Sphere Builder Lockbox. Below are the stats for these 3 awesome new ships. 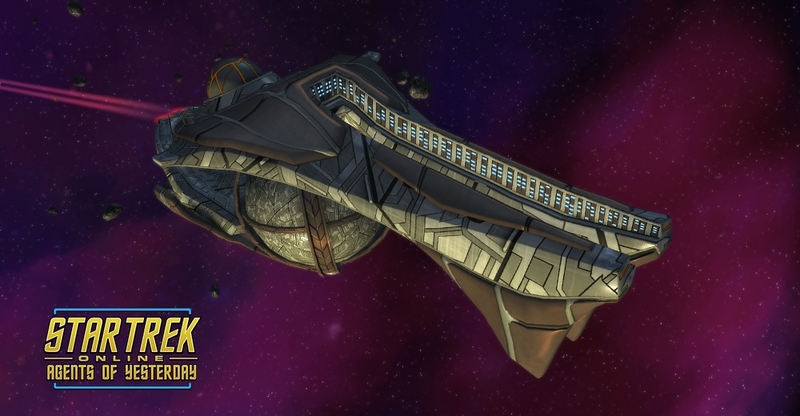 Like many vessels built for temporal conflicts, the Denuos is equipped with Molecular Reconstruction systems, giving it a wide number of tactical options in battle. It also features a Chroniton Fragmentation Warhead Launcher, a devastating weapon system of Sphere Builder design. This starship features a Commander Tactical/Temporal Operative Bridge Officer seat and a Lieutenant Engineering/Command Bridge Officer seat. Temporal Starships are capable of making subtle alterations on the molecular level through the use of Molecular Reconstruction. This technology allows the starship to assume 1 of three different Configurations: Defensive, Offensive and Support. Each Configuration has its own strengths and weaknesses. Each of the Configurations generates their own specific counter. Up to 6 Counters can be generated at a time. These Counters are used to fuel your Molecular Deconstruction Beam. Defensive Configuration provides a boost to Maximum Hit Points and Threat Generation and reduces recharge time on Engineering Bridge Officer abilities, but comes at the cost of a small reduction to Flight Speed and Turn Rate. This configuration also generates 1 Defensive Counter every 10 seconds. Offensive Configuration provides a boost to Flight Speed, Turn Rate and reduces recharge time on Tactical Bridge Officer abilities, but comes at the cost of reduced Maximum Hit Points. This configuration also generates 1 Offensive Counter every 10 seconds. Support Configuration provides a boost to Hull Healing, Shield Healing, Exotic Damage and reduces recharge time on Science Bridge Officer abilities, but comes at the cost of reduced Weapons Damage. This configuration also generates 1 Support Counter every 10 seconds. Molecular Deconstruction Beam inflicts Radiation Damage, reduces its target's damage resistance and disables the target briefly. Offensive Counters increase this ability's damage. Defensive Counters increase this ability's Damage Resistance Debuff. Support Counters increase the duration of this ability's Disable. The Sphere Builder Denuos Dreadnought Carrier [T6] has a pair of hangar bays equipped with Sphere Builder Heavy Fighters. These durable small craft are equipped with Antiproton Beam Arrays, Chroniton Torpedoes and the Beam: Overload I and Channeled Deconstruction I abilities. This starship features a Commander Science/Temporal Operative bridge officer station and a Lieutenant Engineering/Intel bridge officer station. The Sphere Builder Edoulg Science Vessel [T6] has a single hangar bay equipped with Sphere Builder Heavy Fighters. These durable small craft are equipped with Antiproton Beam Arrays, Chroniton Torpedoes and the Beam: Overload I and Channeled Deconstruction I abilities. Additionally, owning both a Sphere Builder Arehbes Destroyer and either the Sphere Builder Edoulg Science Vessel [T6] or the Sphere Builder Dreadnought Carrier [T6] will unlock the ability to purchase Sphere Builder Arehbes Frigate hangar pets. There’s more on this in the Hangar Pets section of this blog. New Bridge: All three Sphere Builder starships feature a new unique Sphere Builder bridge! The Sphere Builder Denuos Dreadnought Carrier comes equipped with the Chroniton Fragmentation Warhead Launcher. When this ability is activated, your starship will launch a projectile that will detonate, in a large area-of-effect, shortly before hitting your target. Foes hit by this explosion will be bombarded by Chroniton Warhead fragments which will cause heavy kinetic damage and have their turn rate and flight speed drastically reduced. After a short countdown, these fragments will explode inflicting shield penetrating heavy kinetic damage. This explosion also knocks a random sub-system offline. This console may be equipped in any console slot, but may only be equipped on Sphere Builder starships. The Sphere Builder Edoulg Science Vessel comes equipped with the Quantum Deceleration Field Generator universal console. When this ability is activated, you will generate a large field around your starship that will gradually slow the flow of time for enemies within its radius. Affected enemies will suffer damage over time that will increase the longer they remain in the field. In addition, foes within the field will suffer from a reduction to flight speed, which increases over time. After remaining in the field for 5 seconds, they will become held for a short time. Targets that remain in the field for the entirety of its 10 second duration will suffer instant heavy Physical damage. This console also provides a passive bonus to the Particle Generators skill and the Science Readiness skill. After reaching level 5 in your Sphere Builder Denuos Dreadnought Carrier, you will unlock the Delphic Shockwave starship trait. While this trait is slotted, your Photonic Shockwave Science Bridge Officer ability will leave behind a localized anomaly that mimics the effects of the Delphic Expanse. Enemies that enter this hazard will suffer radiation damage over time and have their damage resistance reduced. After reaching level 5 in your Sphere Builder Edoulg Science Vessel, you will unlock the Delphic Phasing starship trait. While this trait is slotted, you will gain a stack of Partial Delphic Phasing each time you score a critical hit. You may only generate 1 stack every 2 seconds. Each stack of Partial Delphic Phasing provides an increase to All Energy Damage resistance rating and lasts for a short duration. At 10 stacks of Delphic Phasing, you become immune to Energy Damage for a short time. After this effect wears off, you will be unable to generate stacks of Delphic Phasing for a period of time. These are launched two at a time and each hangar bay can support up to 4 Heavy Fighters at a time. These are launched one at a time and each hangar bay can support up to 2 Arehbes Frigates at a time. The Agents of Yesterday expansion offered us the perfect opportunity to introduce the enigmatic Sphere Builders as antagonists in Star Trek Online. Featured in Enterprise, the Sphere Builders were one of the primary antagonists of the series, pulling the strings behind the scenes in an attempt to alter history. Captains have the chance to fight against the Sphere Builders in the Battle of Procyon V, and now you’ll have the opportunity to use their extra-dimensional technology against them with the Sphere Builder Lock Box. The biggest prizes from the Sphere Builder Lock Box are their ships. This box’s grand prize is the Sphere Builder Denous Dreadnought Carrier [T6], a formidable carrier capable of using the Modular Reconstruction technology found on Temporal Starships. Used by the Sphere Builders to direct the flow of battle across space-time, the Sphere Builder Denous Dreadnought Carrier [T6] includes a Commander Tactical/Temporal Operative and a Lieutenant Engineering/Command Bridge Officer station. This vessel comes equipped with a Console – Universal – Chroniton Fragmentation Warhead Launcher. When fired, the starship launches a projectile which detonates into Chroniton Warhead fragments shortly before reaching its designated target. Enemy ships caught in this large explosion suffer kinetic damage and have their turn rate and flight speeds reduced as the fragments embed into ships. After a few seconds, these fragments then detonate, causing additional kinetic damage which bypasses shields. This console gives a passive increase to Critical Hit Chance and Turn Rate. This console may be equipped in any console slot, but can only be equipped on Sphere Builder starships. The Photonic Shockwave power, when used, leaves a hazard in its wake which deals radiation damage and reduces the damage resistance of foes. Additionally, Photonic Shockwave does not repel foes while this trait is slotted. Captains may purchase the Sphere Builder Edoulg Science Vessel [T6] from the Lobi Store. Like the Denous Dreadnought Carrier, this vessel is capable of using Molecular Reconstruction technology. Reflecting its race’s focus into scientific advancement, the Sphere Builder Edoulg Science Vessel [T6] includes a Commander Science/Temporal Operative and a Lieutenant Engineering/Intel bridge officer station. This vessel comes equipped with a Console – Universal – Quantum Deceleration Field Generator. When activated, this console generates a large field around your starship which gradually slows the flow of time. Nearby enemies suffer a flight speed reduction and damage over time effect, both of which increase in potency the longer enemy ships remain in the field. 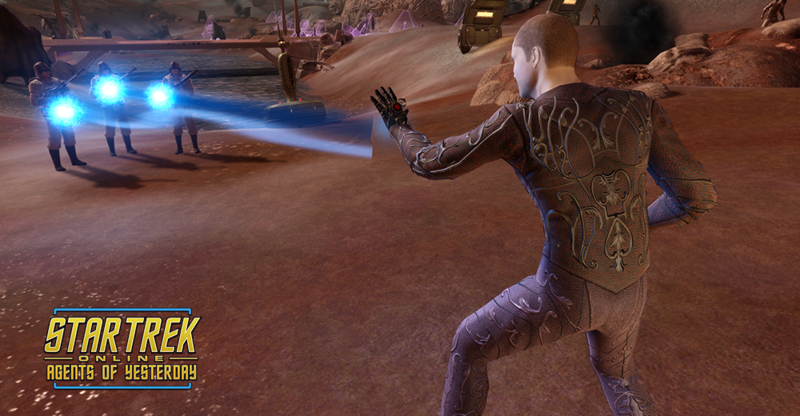 Enemy ships caught within the field for 5 seconds become Held, and take additional physical damage. This console gives a passive bonus to the Particle Generators and Science Readiness skills. This console may be equipped in any console slot, but can only be equipped on Sphere Builder starships. Critically Hitting your foes gives a stacking short-duration Energy Resistance buff. At 10 stacks, Gain Immunity to Energy Damage for a short duration. Can only gain 1 stack every 4 seconds. Triggering Immunity prevents gaining stacks for an extended period of time. Additionally, Captains may win the Sphere Builder Arehbes Destroyer from the Sphere Builder Box. This Tier 5 starship is the Sphere Builder’s primary attack vessel, and can equip Sphere Builder consoles. This destroyer is intended to adjust to any threat, with an average turn rate and a balanced hull and shield strength. Captains who own the Sphere Builder Arehbes Destroyer can also purchase a small craft version of the ship to use with the Sphere Builder Denous Dreadnought Carrier [T6]. There are many other prizes contained within the Sphere Builder Lock Box. Captains may also obtain a new set of Genetic Re-sequencers to unlock access to a suite of two new Ground Traits and two new Space Traits for each career. Reroute Power to Shields applies a lesser shield heal to nearby allies. Support Drones gain an additional wide beam attack. Tricorder Scan gives you a Crit Severity buff. Reduce the recharge time of Nanoprobe Infestation if the primary target dies while it is active. Security Escorts may throw grenades. Reduce the recharge time of Fire on my Mark (ground) if the target dies while it is active. EPS Power Transfer gives an additional effect based on which power level was highest at the time of activation. Nadion Inversion increases Energy Weapon Damage. Subnucleonic Beam drains power from the target to increase your power levels. Photonic Fleet summons a 4th ship. Go Down Fighting can be used at any hull level. Reduce the recharge time of Fire on my Mark (space) if the target dies while it is active. Deploys an Explosive Drone, a miniaturized version of the Xindi Superweapon. Is equipped with an Antiproton Beam and approaches targets. Drone explodes when within close proximity to targets. Applies a Damage Resistance debuff and physical damage over time effect to a target. Damage over Time increases over duration. After 6 seconds, causes physical damage in an area around the target. Kinetic damage to a target with severe Knock Back. Ranks I, II, and III of the above abilities can also be found as Bridge Officer Training Manuals. These start at Lieutenant for Rank I, with Lieutenant Commander for Rank II, and Commander for Rank III. Additionally, the Sphere Builder Lock Box contains new Space and Ground Weapons within the Delphic Antiproton Weapon Pack. This pack contains a suite of new Cannons, Beams, and Ground Weapons which incorporate the Sphere Builder’s extradimensional technology. Delphic Antiproton weapons have a chance to give the user a substantial Critical Hit and Critical Severity increase for a short time. The Lobi Store also contains a Sphere Builder Antiproton Repulsor which has been properly shielded to prevent decay upon exposure to our dimension. This weapon has a single-target primary fire, a rapid-sweep Exploit secondary fire, and can trigger the Delphic Antiproton weapon proc. The Sphere Builder Antiproton Repulsor’s primary fire has the added benefit of being able to Expose targets, and does additional damage to targets which are Exposed. Captains who appreciate the Sphere Builder’s aesthetic can purchase the Sphere Builder Outfit Box from the Lobi Store. This outfit unlocks both Upper and Lower Body options for Male and Female characters. The Sphere Builder Lock Box, and the new Lobi Crystal Store offerings, will become available to PC Captains beginning on October 25th, 2016.